JK Imaging has announced the upcoming launch of two Kodak-branded lens-style cameras to compete with Sony’s QX gadgets. 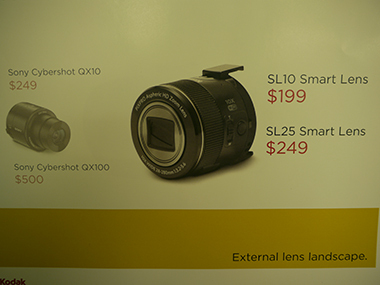 There will be a 25x zoom PixPro Smart Lens (24mm wideangle) and a 10x zoom model (28mm wideangle – pictured above), each carrying a 16MP imaging sensor, optical image stabilisation and Full HD video. They include a Micro SD card slot and a rechargeable battery. The PixPro SL10 and SL25 will be NFC/Wi-Fi compatible and are due for launch in April. JK Imaging, the worldwide licensee for Kodak PixPro devices, claims that the ‘snap-on’ smart lenses will ‘catapult mobile photography to the next level in quality, convenience and on-the-go sharing’. Samsung’s latest line of Smart Cameras includes a bridge model with a 60x optical zoom (20mm focal length at the wide end). The 16.3MP WB2200F ‘premium’ model also features a 3in (VGA resolution) LCD screen, an EVF, Full HD video, plus Wi-Fi/NFC wireless connectivity. A UK price and launch date has not yet been announced. Two new Selphy printers from Canon feature improved connectivity – designed to print images direct from smartphones (Android and iOS operating systems). The Selphy CP910 and CP820 are due on sale this month priced £99 and £89 respectively. Canon has also unveiled a new 16MP Ixus compact, the Ixus 265 HS (out in March priced £179) with a 12x lens; and the 16MP PowerShot SX600 HS, carrying a wideangle 18x lens (available next month costing £199). Both models are Wi-Fi and NFC equipped. Epson will not announce any photographic printers at CES. Instead the firm used a press conference in Las Vegas to focus on ‘wearable technology’ such as its second-generation ‘smart glasses’ – to deliver a ‘new world of augmented reality’. Panasonic has showcased a 42x ‘entry-level’ bridge camera (pictured below) called the DMC-LZ40, and tells AP that the bridge market ‘is an important area for us’. 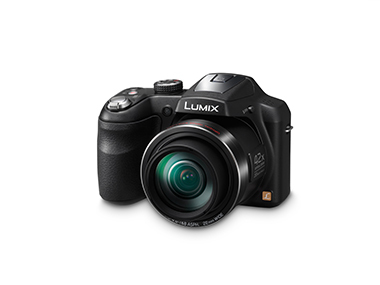 Features include a 3in (460,000-dot resolution) LCD screen and 22-924mm lens. A spokesman said such cameras are designed as a back-up model for photo enthusiasts, rather than being their main camera. It is expected to cost £229. Fuji has pledged to expand its X-mount lens line-up to 17 by 2015, in a new lens roadmap published today. Future lenses will include a 16-55mm f/2.8 R OIS; 50-140mm f/2.8 R OIS; and 18-135mm f/3.5-5.6 R OIS. It is also working on a ‘super telephoto zoom’ and a ‘high-speed wideangle prime lens’, details of which are yet to be confirmed. Fuji has launched an all-black version of its X100S high-end compact following calls from customers. The X100S Black, due out this month, costs £999.99. Matching accessories include a 28mm wide conversion lens (£329.99) and a black leather case (£99.99). Next month will see the debut of a new Fuji compact camera designed for the outdoors in the shape of the FinePix XP70. Built to be ‘waterproof, shockproof, freezeproof and dustproof’ the 16.4MP XP70 will cost £169.99. It carries a 5x lens (28-140mm equivalent), optical image stabilisation and wireless image transfer.